Reference number for this case: Nov-54-Saint-Waast-la-Vallée. Thank you for including this reference number in any correspondence with me regarding this case. 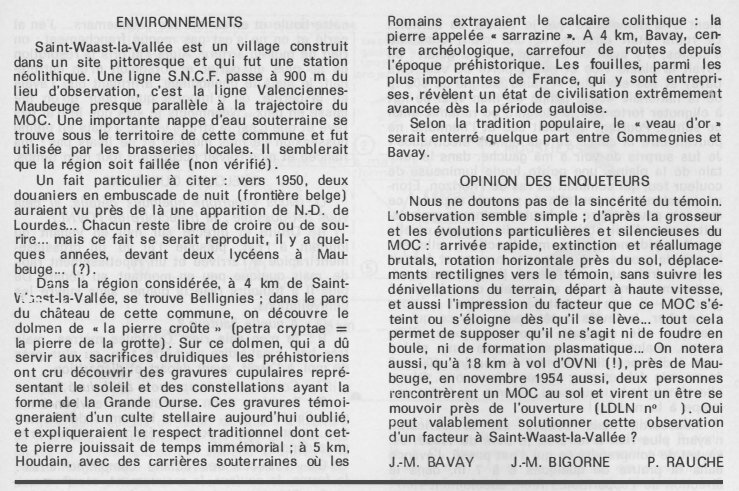 An investigation report by J. M. Bavay, J. M. Bigorne, and P. Rauche appeared in the ufology magazine Lumières Dans La Nuit (LDLN), France, #123, pp 8-10, in March 1973, about the observation of Mr. Roland X. He was 27-year-old in November 1954, he was a postman and made many professional trips. In the evening, he had visited his fiancée at La Flamengrie, "a hamlet in Saint-Waast-la-Vallée". Around midnight or half-past midnight, he was riding home on his bicycle, taking the road to La Casquette in Saint-Waast, thinking deeply of the young lady he had just left. The road was deserted, the sky clear, filled with stars, there was a moonlight; it froze; one could see the plain empty and bare as far as the eye could see, towards Bavay and its surroundings. Barely 800 meters from the Route Nationale 49, the lamp of his bike flashed strongly, extinguishing, reigniting, and so on, although it was dry and moisture could not not be the cause of these electrical troubles. He was surprised to see on his left, in the distance of the plain, a small luminous ball of fire color that seemed to be close to the horizon. Astonished, he slowed down a bit so he could see what it could be. The luminous ball grew visibly and he realized that it was coming fast in his direction. It was soon "the size of a small orange" and was still heading straight for him. Frightened, he hurriedly dropped his bike and jumped into the left ditch - there was no ditch on the right - to hide. He raised his head to see what was going on, and the ball was still moving, still silent, now as big as a full moon, at a distance hardly assessable, perhaps 400 meters. He stood up to see better, and the thing suddenly went out, "like a lamp witched off at home!" Stunned but driven by curiosity, having nothing to do there, he came out of the ditch trying to understand what had happened. He advanced 6 to 7 meters into the meadow in the direction of the appearance but there was nothing to see. He then went back on the road and got on his bike to leave. Suddenly, the ball reappeared, but much closer and much larger, "like a big sun at about 50 meters". It was still a bright, glare-free color, with small variations in luminous intensity, and he saw that it rotated on itself, but he could not say whether it was from right to left or vice versa. Terrified, he dove into the ditch again and watched from the corner of his eye. The ball moved at ground level, at about 50 centimeters or 1 meter. The witness was afraid of "perishing here, alone in my ditch", he decided to act, stood up, and the ball then turned pale, then became luminous and diminished in size "like a deflating balloon, and in a flash it disappeared as if it was going straight away from him, slightly uphill, "as if it was reacting when I got up!" Distraught and trembling with fear, he left the ditch, took his bike, and pressing hard on the pedals, he moved away from the place taking care not to connect the dynamo, riding by the moonlight so that the "thing" would not spot him. Back home, he awoke his parents who had a hard time believing him and blamed him for not having alerted them. The witness did not sleep that night. Early in the morning, he confided the event to his fiancée; still trembling, thinking about it unceasingly to the point of being clumsy in his work. He was extremely nervous and stayed for several months. He dreamed of the ball and had nightmares. He talked about it, and whereas people did not laugh at him frankly, they laughed in his back. He resolved not to speak of it any more, and when questioned, he denied the observation by saying that he had been mistaken, or by giving any other excuse so that people stop annoying him. But he said he is sure he did not dream, that he was in full possession of his means, that did not "read" because his fiancée and his work occupied all his time. After hearing this story, the investigators questioned him, first on the trajectory of the UFO: "Right and direct on me coming from far away to the East, since I saw a rapid magnification at the arrival and a rapid shortening, but somewhat upwards, at the start. Also it always razed the plain, without following its unevenness." He cannot tell them the exact height but thinks it was very low, "a few meters, but very low, that is to say maybe 1 meter, closer to me, when it stopped, before departure and disappearance." He cannot give a size for the ball, estimating it at "maybe several meters, maybe 3 or 4, or more!" He gives the duration of the observation as maybe 4 minutes in all, with about 3 minutes for the arrival and including the time of disappearance, and a minute for the reappearance closer and the final departure. He specified on request that the thing was a ball, perhaps not perfect, but clear, without halo, nor haze, but with an outline a bit vague. There was no light projection, it illuminated neither the ground nor the surroundings. The color was always "fire", that is to say a kind of yellow-orange, with small variations of luminous intensity; at the time of departure it turned pale and then resumed its brightness before decreasing. It showed no sway or other "fantasy" during its move. There was no sound from beginning to end, the environmemt being "totally quiet at this hour!" Asked about effects on a possible wristwatch, he said he had his wristwatch but never noticed any effect on it. He had no physiological consequence except excessive nervousness for several weeks and even several months. His mood "was never affected." He explains that he did not say anything to the gendarmes because he wanted to be left in peace and did not know and still does not know what this huge ball was, "which could have made me beat cycling records, so much I was afraid!" The investigators say they heard this witness 18 years after the fact; he was reluctant to talk, because he did not want to talk about it anymore, but the facts were still fresh in his mind. The investigators indicate that they do not doubt the sincerity of the witness, that the observation seems simple; according to the size and the particular and silent evolutions of the UFO: fast arrival, sudden extinction and re-ignition, horizontal rotation close to the ground, rectilinear movements towards the witness, without following the unevenness of the ground, departure at high speed, and also the feeling that it goes out or goes away as soon as he gets up. They therefore assume that it was not ball lightning or plasma formation, and ask who would have the solution. Investigators report that a railway line goes by 900 meters from the place of observation, the Valenciennes-Maubeuge line, "almost parallel to the trajectory of the phenomenon." We met Mr. Roland X... agent of the postal services in his residence. After many reservations, because he did not want to speak about it more, he told us the facts which happened 18 years ago, but are still fresh in its spirit. It happened in the community of Saint-Waast-la-Vallée, a few kilometers from Bavay, and practically halfway between Maubeuge and Valenciennes (Department of the Nord). about the young lady that I had just left... The road was deserted, the sky clear, constellated with stars, there was moonlight; it froze; one saw the empty and naked plain as far as the eye can see, towards Bavay and its surroundings. Hardly was I engaged of 800 meters on the main road 49, that the lamp of my bicycle started to flicker strongly, died out, re-ignited, and so on... However the weather was dry and moisture could not be the cause of these electric troubles! I was surprised to see on my left, in the distance of the plain, a small luminous ball of fiery color, which seemed at the level of the horizon. Astonished, I slow down a little in order to be able to look at what that could be, the luminous ball grew noticeably bigger and I realized that it came quickly in my direction; it soon had the size of a small orange and was still darting at me! Frightened, I gave up my bicycle precipitately and jumped in the left ditch - there were no ditch on the right! - to hide. I raised the head to see what occurred... it still advanced, still silent, now large like a full moon, the distance was not easily appraisable: 400 meters? I stood up for better seeing again, and then, it died out suddenly, as when you switch off a lamp in the house! Suddenly the ball reappears abruptly, but much nearer and much bulkier, like a large sun at 50 meters approximately. Still with a fiery color, not dazzling, it has small variations of luminous intensity, and I see that it rotates, without being able to specify if it is was right-hand or the left-hand side... Terrified, I jumped down again in the ditch... but to keep it under my eyes! It advances at the level of the ground, at 50 cm or 1 meter, I was never sure. I thought quickly that I cannot perish here, alone in the ditch; it is necessary to act: I stand up, and here it is, fading extremely, becoming luminous again and its size decreasing... Like a balloon which deflates, and in a flash it disappeared as if it moved away right in front of me, slightly going up. One would say it reacted when I stood! Helpless and shaking of fear, I left the ditch in a rush, went on my bicycle again, and pushing with all my forces on the pedals, I moved away from the place taking care not to connect the power generator, and I ride under the moonlight and not to get located by this "thing." Arriving home, I woke my parents up, they had difficulties believing me and reproached me for not having come to get them... That's a good one!!! I did not sleep this night. Early in the morning, I discreetly told of this very unusual event to my fiancée; I was still shaking about it. I thought of it relentlessly and that disturbed me in my work, I was extremely nervous and remained nervous during several months. I dreamed of this ball and made nightmares of it... I spoke about it and one did not frankly laugh: I was laughed at behind my back. Then I took the resolution not to speak about it anymore and when one sarted with the topic, I denied the phenomenon, claiming that I had been daydreaming or anything so that I was let in peace. Nevertheless I know that I did not dream and that it is the plain truth. I was in full possession of my means and did not read: my fiancée and my work occupied all my time. Q: We would like some details, if this is possible for you; the trajectory of the UFO? R: Straight and directly onto me, while coming from the distance in the East, since I saw a fast enlargement on arrival and a fast reducing, but somewhat while going up, at the start. Moreover it always flew near ground level, without following the ups and downs of the ground. R: I don't know. A few meters, but very low, i.e. maybe 1 m, when it was the closest to me, stopped, before departure and disappearance. Q: How much time did that last? R: Perhaps 4 minutes in all, with approximately 3 minutes for the arrival and including the time of disappearance, and one minute for the more close reappearance and the final departure. Q: Do you have additional details: the shape, the color, the movement, etc? R: None, from the beginning to the end. And yet it was totally quiet at this hour! Q: Did you have a watch? How did it behave? R: I had a watch, but I never noticed anything. Q: In your humble opinion, what was the diameter of this sphere? R: I don't know. Several meters. Maybe 3 or 4, or more! (this is perhaps close to the truth, because according to the parameters given thereafter, it was nearing 3.50 meters). Q: What were the physical and moral consequences? R: Nothing from the physical point of view, except an excessive irritation during several weeks and even several months. As for the moral, it was never affected. Q: And official services and gendarmerie? R: I never said a word of it to them; I wanted to be left in peace and I did not know and still do not know what was this enormous ball, which could have made me beat cycling records, so much I was afraid! Saint-Waast-la-Vallée is a village built in a picturesque site and which was a Neolithic location. A railway line passes at 900 meters of the observation spot, it is the Valenciennes-Maubeuge line almost parallel with the trajectory of the M.O.C. Important underground water is under the territory of this community and was used by the local breweries. It would seem that the area is vaulted (not checked). A particular fact to quote: around 1950, two customs officers in night ambush (on the Belgian border) are said to have seen an appearance of Our Lady of Lourdes... Everyone is free to believe or smile... but this fact is said to have happened again, a few years ago, in front of two high-school pupils in Maubeuge... (?). Bellignies is located in the considered area, at 4 km of Saint-Waast-la-Vallée; in the park of the castle of this community, one discovers the dolmen of "the crust stone" [la Pierre Croûte] (petra cryptae = the stone of the cave). On this dolmen, which must have been used for druidic sacrifices it was believed that engravings were discovered, representing the sun and of the constellations having the shape of the Big Dipper. These engravings would testify to a now forgotten stellar cult, and would explain the traditional respect which this stone enjoyed in ancient times; at 5 km, Houdain, with underground careers where the Romans extracted limestone colithic: stone called "Sarrazine." At 4 km, Bavay, an archaeological center, crossroads of roads since the prehistoric time. The excavations, among the most important of France, which are undertaken there, reveal a state of an extremely advanced civilization of the Gallic period. According to the popular tradition, the "golden calf" is said to be buried somewhere between Gommegnies and Bavay. We do not doubt the sincerity of the witness. The observation seems simple; according to the size and the particular and quiet evolutions of the MOC: fast arrival, extinction and brutal relighting, horizontal rotation close to the ground, rectilinear displacements towards the witness, without following the unevennesses of the ground, departure at high speed, and as the impression of the postman as this MOC died out or moved away as soon as he stood up... all this makes it possible to suppose that it is neither ball lightning nor a plasmatic formation... It will also be noted, that at 18 km of UFO flight(! ), close to Maubeuge, in November 1954 also, two people met a MOC on the ground and glimpsed at a being moving close to the opening. Who can validly solve this observation by a postman in Saint-Waast-la-Vallée? M.O.C. stands for Mystérieux Objets Célestes, or Mysterious Celestial Objects, a acronym which was more popular although equivalent to U.F.O in France at that time. These two authors indicate that in one unspecified day of November 1954 at midnight or midnight 30 minutes in Flamengrie close to Saint-Waast-la-Vallée, Roland X, postman, returned from seeing his fiancee in Flamengrie and was riding his bicycle on the road from Casquette to Saint-Waast. It froze, the sky was clear and full of stars, the visibility on the plain was perfect towards Bavay and its surroundings. Whereas he was at 800 meters from main road N49, the lamp of his bicycle started to flicker strongly, dying out, being re-ignited alternatively. At this time, he saw a luminous ball of the color of fire which had the apparent dimensions of the full moon and which advanced towards him. It became frightened and threw himself in the ditch. When the ball was at a distance evaluated as 400 meters of him, it extincted suddenly. When he went up on his bicycle again, it was abruptly re-ignited, "like a large sun", within 50 meters from him approximately. He then again jumped in the ditch. From there, he observed the luminous ball advance at 50 cm or 1 meter above the ground. He came out of the ditch and at this time the light had strongly dimmed, became again luminous and decreased in size like a deflating balloon, then it disappeared. There had been no sound coming from the ball. Roland X went up on his bicycle and pedaled of all his forces, having disconnected the dynamo. The authors indicate LDLN N. 123, pages 8 to 10, as their source. The author indicates that at the beginning of November 1954 at 00:30 in La Flamengrie, St Waast-la-Vallée, in the Nord, Mr. Roland X rode a bicycle on the road of Casquette in St. Waast. Within 800 meters of the N49, the lamp of his bicycle starts to strongly flicker, dies out, re-ignites and so on, and he suddenly notices a luminous ball of fire color which comes towards him. Frightened, he hid in a ditch. The ball took the appearance of the full moon, then 400 meters further, turns off and on again to reappear like the sun. The phenomenon evolves 50 meters above the road then disapears opposite the witness who flees on his bicycle. The source is indicated as LDLN N.123 pages 8 to 10. The Belgian ufologist indicates that in 1954, in November, in France, in La Flamengrie (St Waast la Vallée), "Between midnight and 0:30 Roland returns from seeing his fiancee and rides by bicycle on the road of Casquette. Within 800m of the N49, the light of the bicycle starts to strongly flicker, dies out, is re-ignited, and so on. At this time he sees a luminous ball of fire color which advances towards him; Frightened, he hides in a ditch, the ball now has the size of the full moon. Within 400m of him, it dies out suddenly. Roland goes up on the bicycle, but here is the ball within 50m of him, like a large sun. Frightened he dives in the ditch again. It advances at 50 cm of the ground. The witness leaves the ditch, sees the ball fading, becoming again luminous, decreasing by size like a deflating balloon and disappearing in front of him. He goes up on his bicycle, pedals of all his strength without turning the dynamo on! (M. FIGUET / J.L. RUCHON: "Ovni, Premier dossier complet... " Alain Lefeuvre pub. 1979, p. 205)"
Jean-Pierre D'Hondt published the [in1] investigation report; which source is given as Lumières Dans La Nuit #123 for March 1973. Luc Chastan indicates that in the Nord in La Flamengrie in November 1954 at 00:00 hours, the witness returns by bicycle of La Flamengrie under the moonlight. 800 meters from the N49, the lamp of the vehicle dies out, re-ignites and flickered on. At this time, he sees a luminous ball of fire color advancing towards him. The witness hides in a ditch, frightened. The ball now has the apparent dimension of the full moon. At approximately 400 meters of the witness, the object dies out abruptly. The witness goes up on his bicycle, when the object lights again within approximately 50 meters approximately. He dives again in the ditch. The object is approximately 3 to 4 meters in diameter and advances at 50 cm, 1 m of the ground. The witness leaves the ditch, the object fades, becomes luminous again and decreases in size like a balloon that one deflates and disappears. The website indicates that in November 1954 at 21:00 in La Flamengrie, France, a bicycle lamp flashes, a 4m fireball approaches, shrinks to nothing. An object was observed. Electromagnetic effects were noted. Traces were found. One white ball, about 20 feet across, around 300 feet away, was observed by one witness on a farm for 30 minutes. Witnesses names are said to be Mozin; Pipers. The sources are indicated as Guieu, Jimmy, Flying Saucers Come from Another World, Citadel, New York, 1956; Bourret, Jean-Claude, The Crack in the Universe: What You Have Not Been Told about Flying Saucers, Neville Spearman, St. Helier, Jersey, 1974, ISBN:85978-029-5; Bonabot, Jacques, Catalog of Belgian Cases; UFO Nachrichten (Veit), UFO Nachrichten (Germany); Delaire, J. Bernard, UFO Register Volume 7 (1976), Data Research, Oxford, 1976; Hatch, Larry, *U* computer database, Author, Redwood City, 2002. [ud1] tells of one witness; which is true, but gives 2 witness names. The second, "Pipers", relates to a different case, described in the catalogue of Belgian cases by Jacques Bonnabot and earlier in 1956 by Jimmy Guieu in "Black-Out sur les Soucoupes Volantes" pp 236-237. The witness is Martial Pipers, a gardener in his forties near Tournai in Belgium, whose clothes were put on fire by a green light on his chest as he rode home on bicycle in the mid of November 1954. As for the name "Mozin" given in [ud1], it also has nothing to do with the case, it relates to the case in Maubeuge on October 16, found by [ud1] in Jean-Claude Bourret's book. We know that Roland X. had left La Flamengrie, that he took "the road to La Casquette in Saint-Waast", and was "barely 800 meters away from the Nationale 49", currently Route Départementale 649 it seems to me - there. The investigators indicate that a "railway line passes 900 meters from the place of observation, the line Valenciennes-Maubeuge, almost parallel to the trajectory of the phenomenon". He therefore probably took the National Route 2 first, going north to the outskirts of Maubeuge, then going west on the RN 49 towards Saint Waast. This road runs along a railway line located at its south, but it is the Saint-Waast - Maubeuge line. On this portion of the RN49, the witness has already pedaled nearly 40 kilometers since leaving La Flamengrie (love motivates! ); that is why I use for the place name of this case "Saint-Waast" and not "La Flamengrie" as the other sources do. I did not find the "Route de la Casquette". There is a place called "La Casquette", but it is southwest of Saint Waast on the D154, he would have made detours if he had passed both there and on the National Road 49. Another, small, problem, the witness evokes "the plain empty and bare as far as the eye can see, towards Bavay and its surroundings"; he would then have been located before Bavay; if he was on the RN49 between Bavay and Saint-Waast, he would have Bavay in the back and are evocation would be odd. The investigators were not careful about the sighting location details, in my opinion. If the witness was on the RN 49, he was not 900 meters from the Valenciennes-Maubeuge line but at a distance variable from 0 to 500 meters from the Saint Waast-Maubeuge line. Ball lightning: It requires stormy conditions; the witness speaks of dry weather and there is no mention or clue of any storm. A train: Although being aware of the presence of a railway, the investigators did not consider the headlights of a train. Yet it seems clear that the luminous "ball" was constantly at ground level, it never rose in the sky nor down. Could this explain the observation? We have one and only one apparent angular size, given by the witness, that of the size of the full Moon ("now as big as a full moon"). We would have, say the investigators, the railway at 900 meters. The apparent diameter of the full moon is 0.5°, or 30 minutes of angle. The phenomenon would therefore have 7.85 meters at 900 meters. This could possibly correspond to a light cone of train headlights seen from the side. The witness sees one and only one ball and describes it as sharp outlined, and not illuminating the surroundings. We have the fact that despite the silence, the witness does not hear a train, the fact that he rode there often. So I could not convince myself that the UFO was the headlights of a train. [in1] Investigation report by J.M. Bavay, J.M. 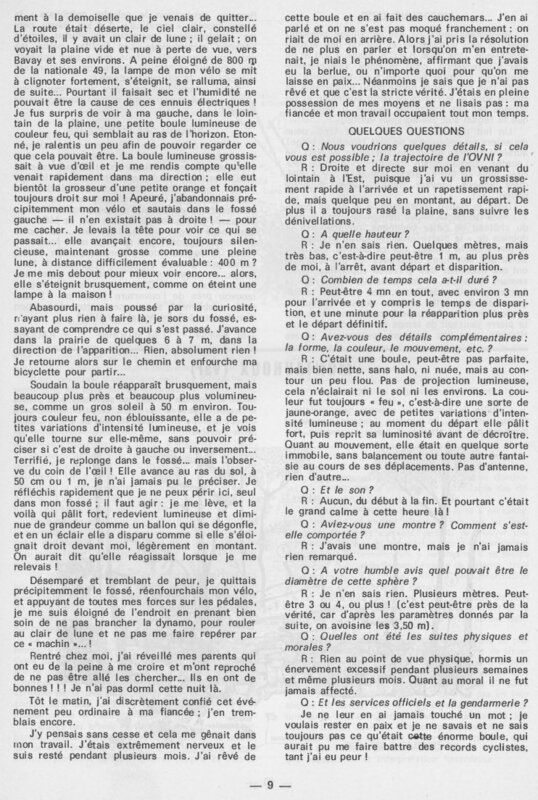 Bigorne, P. Rauche, in the ufology magazine Lumières Dans La Nuit (LDLN), France, #123, pp 8-10, March 1973. [in1] Ufology magazine Lumières Dans La Nuit (LDLN), France, #123, pp 8-10, March 1973. [fr1] "OVNI, Premier Dossier Complet des Rencontres Rapprochées en France", book by Michel Figuet and Jean Louis Ruchon, Alain Lefeuvre publisher, France, pp 205-206, 1979. [mf1] "Catalogue Francat des rencontres rapprochées en France (Listing 800 1982) (2 - Suite)", list compiled by Michel Figuet, in the ufology magazine Lumières Dans La Nuit (LDLN), France, #257-258, page 20, novembre - décembre 1985. [js1] "Le Dossier 1954 et l'Imposture Rationaliste", book by Jean Sider, Ramuel publisher, France, page 268, 1997. 1.0 Patrick Gross December 21, 2008 Conversion from HTML to XHTML Strict. First formal version. Additions [js1], [jd1], [lc1], [ud1]. 1.1 Patrick Gross March 8, 2010 Addition [go1]. 1.3 Patrick Gross December 4, 2018 Additions [mf1], [lh1]. Addition of the Summary. Explanations changed, were "Not looked for Yet."